The remnants of Post-Tropical Cyclone Prapiroon were spotted by NASA-NOAA's Suomi NPP satellite as they were moving over Japan's Hokkiado Prefecture in northern Japan. On July 5, the Japan Meteorological Agency noted that advisories remained for much of Hokkaido, and just the Abashiri Chiho area remained under a warning. The advisories consist of flooding, heavy rain, dense fog, and high waves in coastal areas. 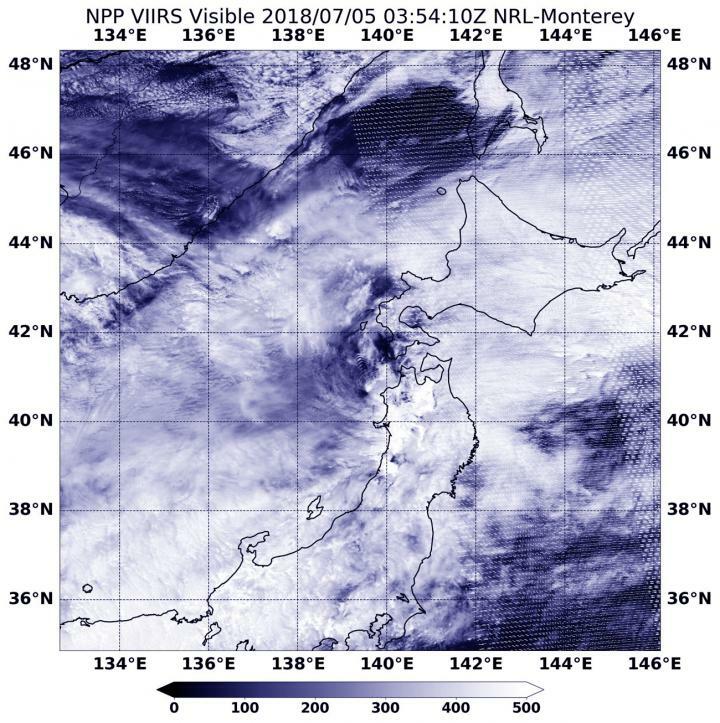 On July 5 at 0354 UTC (July 4 at 11:54 p.m. EDT) the Visible Infrared Imaging Radiometer Suite (VIIRS) instrument aboard NASA-NOAA's Suomi NPP satellite captured a visible image of the remnants over northern Japan and stretching into the Northwestern Pacific Ocean. Prapiroon's remnants continued to move in a north-northeasterly direction into the Northwestern Pacific Ocean.